A “gate to hell” has emerged from ruins in southwestern Turkey, Italian archaeologists have announced. Known as Pluto’s Gate — Ploutonion in Greek, Plutonium in Latin — the cave was celebrated as the portal to the underworld in Greco-Roman mythology and tradition. “This space is full of a vapor so misty and dense that one can scarcely see the ground. Any animal that passes inside meets instant death,” the Greek geographer Strabo (64/63 BC — about 24 AD) wrote. “I threw in sparrows and they immediately breathed their last and fell,” he added. Announced this month at a conference on Italian archaeology in Istanbul, Turkey, the finding was made by a team led by Francesco D’Andria, professor of classic archaeology at the University of Salento. D’Andria has conducted extensive archaeological research at the World Heritage Site of Hierapolis. Two years ago he claimed to discover there the tomb of Saint Philip, one of the 12 apostles of Jesus Christ. Founded around 190 B.C. by Eumenes II, King of Pergamum (197 B.C.-159 B.C. ), Hierapolis was given over to Rome in 133 B.C. The Hellenistic city grew into a flourishing Roman city, with temples, a theater and popular sacred hot springs, believed to have healing properties. “We found the Plutonium by reconstructing the route of a thermal spring. Indeed, Pamukkale’ springs, which produce the famous white travertine terraces originate from this cave,” D’Andria told Discovery News. Featuring a vast array of abandoned broken ruins, possibly the result of earthquakes, the site revealed more ruins once it was excavated. The archaeologists found Ionic semi columns and, on top of them, an inscription with a dedication to the deities of the underworld — Pluto and Kore. D’Andria also found the remains of a temple, a pool and a series of steps placed above the cave — all matching the descriptions of the site in ancient sources. “People could watch the sacred rites from these steps, but they could not get to the area near the opening. Only the priests could stand in front of the portal,” D’Andria said. According to the archaeologist, there was a sort of touristic organization at the site. Small birds were given to pilgrims to test the deadly effects of the cave, while hallucinated priests sacrificed bulls to Pluto. The ceremony included leading the animals into the cave, and dragging them out dead. Only the eunuchs of Cybele, an ancient fertility goddess, were able to enter the hell gate without any apparent damage. According to D’Andria, the site was a famous destination for rites of incubation. 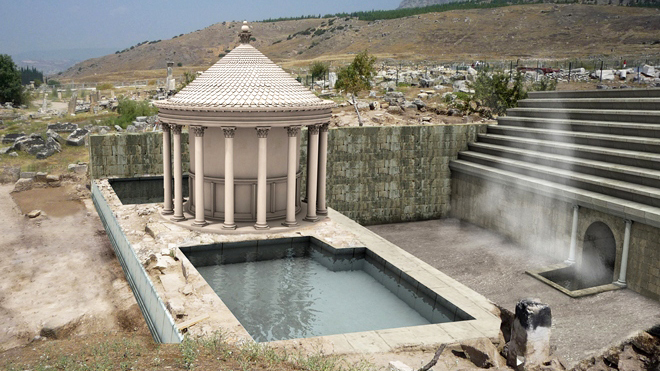 Pilgrims took the waters in the pool near the temple, slept not too far from the cave and received visions and prophecies, in a sort of oracle of Delphi effect. Indeed, the fumes coming from the depths of Hierapoli’s phreatic groundwater produced hallucinations. Fully functional until the 4th century AD, and occasionally visited during the following two centuries, the site represented “an important pilgrimage destination for the last pagan intellectuals of the Late Antiquity,” Filippini said. During the 6th century AD, the Plutonium was obliterated by the Christians. Earthquakes may have then completed the destruction. D’Andria and his team are now working on the digital reconstruction of the site. Previous: Kevin Ware Leg Breaks in Two Places! Next: Emma Watson Sizzles on GQ Cover! “I threw in sparrows and they immediately breathed their last and fell,” WTF? You didn’t have some state of the art gadget to test the air? Idiot! You knew that life could not breath in there so what was the point of this ignorant move? Go test the air yourself moron. TomTom hit by Leap Year bug, many devices fail to work! Jobs Available, Unemployed Need Not Apply! ?